Claudio Arrau's Sonatas set is one to live in. It is a cycle so full of thoughts, musical richness and grandeur, that even after repeated listening sessions you will want to hear it again, and again. I may go so far to say that it's one of the most amazing recordings of anything I've yet heard. True, it took me some time to realize this. 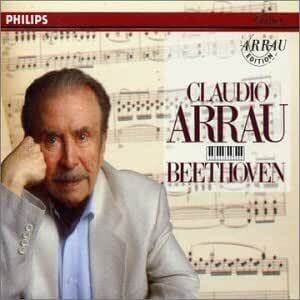 But I've come to like Arrau's interpretations, more than any other pianist's. I don't think it would right to talk about `the best' Beethoven cycle, as there isn't just one perfect way to the top, but so far I consider Arrau's performances deeper and more satisfying than anyone else's. He is unmatched in revealing the essence of the sonatas, and no one can hold a candle to Arrau's injections of drama in fairly every piece. It is as if you're living through the sonatas yourself, as one reviewer said on another page. Arrau takes a very serious, almost dark and tragic, approach to the sonatas. He may miss some of the music's humor because of that, but on the whole the effect is very rewarding. On paper it may seem that Beethoven's earlier works do not profit from Arrau's approach, but it's not true in reality. He performs these pieces as if they are just as important as the later works, and hearing him I can only prove him right. I've not yet heard anyone who makes these sometimes ignored pieces so interesting and powerful. The serious weight he gives to the very first sonata is amazing, especially in the last movement. The op.7 sonata is much more than just a pretty dancing piece. And even in the normally sunny second sonata, its dark sides are most significant in Arrau's performance. The fifth sonata is played quite slowly but with so much content and attention to every moment that it is just breathtaking. Overall, Arrau's bold and thoughtful playing reveals a great amount of hidden treasures in these sonatas and lets every phrase sing with great beauty. The grandeur of Beethoven's middle-period works like the Moonlight, Tempest, Waldstein and Appassionata is in equally superb hands, especially in the Appassionata whose outer movements are greatly intimidating and violent, even though Arrau never plays extremely loud. Arrau's Waldstein is notable for its unusually slow first movement that yet remains fascinating all the way through. His Moonlight made me listen again to this piece that I got bored of a little. I don't think the Moonlight's last movement is weak, as others say. Maybe it doesn't live up to the extreme standards of the rest of the set, but even then it is among the better renditions. Again, the more humorous pieces of this period are less swift and surprising than in other's renditions. The final of the op.31/3 `Hunt' sonata gives no single reason to laugh. But Arrau fills the gap with so much furious power and intensity that I strongly doubt which approach to prefer. The final of Les Adieux is heaven-storming instead of the usual children's party treatment, and you may understand what I prefer. And even after all these amazing performances, the highlight of the set hasn't been reached. That honour goes unequivocally to the late sonatas. Arrau's arresting performance of op.101 is a hint of what's coming after: the Hammerklavier. Of all the great performances I've heard of this sonata of sonatas, among them Richter, Gilels, Pollini, Kovacevich and Brendel, this is undoubtedly the best. The scrupulous attention and majesty in the first movement, the noble scherzo, the divine slow movement and the titanic fugue (faster than anyone else plays it!) combine to an ageless performance. The last three sonatas then, all sound completely different from other recordings. Arrau gives a highly personal performance of the theme and variations of op.109, which I found mannered at first, but the more I listened the more I understood its divinity. The last variation is one of the greatest moments of all Beethoven, and likewise it is one of the most memorable performances of Arrau. The op.110 sonata is on a similar scale, with the fugue played in total devotion and concentration. Another performance I disliked at first is that of the last sonata, op.111, but I've come to realize how impressive his slower take on the first movement is. And that Arietta, oh my! It isn't an easy-listening performance and may sound strange at first, but as soon as you `get' it, you don't want anything else. Everything is so deeply felt, intense and detailed (the trills are inhuman! ), that this is my favourite Arietta. Again, the set may not seem as good at first. Arrau misses most of Beethoven's humor, and his playing is a little slow and careful at times. But that's just the surface. Beneath, there is an immense amount of fantastic insights waiting. Arrau's early sonatas sound like they have got a repainting, and a superb one at that. The middle-period pieces get an intensely tragic and dark treatment, and the late sonatas are played quite originally and among the most profound and spirited recordings ever made. I doubted first, but now I simply love this set more than fairly any other recording I have. Regarding the comments of other reviewers here, I doubt if many will disagree. There are other ways to play Beethoven, but this is a Beethoven sonata set for the ages, a great investment if there ever was one. This review is primarily a very hearty second to the review above by Huibert Jonkers. I do not have as much musical expertise as those who normally review recordings like this, like Mr. Jonkers. My views are mostly based on my experience living with this music over a period of many years. Over the last 20 years, I have owned and listened to 8 or 9 integral sets of the Beethoven piano sonatas. I whittled them down to three 'keepers:' recordings by Artur Schnabel, Alfred Brendel and Claudio Arrau. All three have very special virtues in my opinion and I recommend all three heartily. Of these three, I listen to Arrau the most and derive the deepest and most consistent pleasure and uplift. And I tend to linger longer over Arrau's recordings than I do over the work of the other artists, though I love them dearly. After nearly twenty years of owning this recording, I still find listening to it a rare and deeply rewarding experience. There is nothing to add to the comments on the musical quality of this release - they are great in the best and truest meaning of that word. but the famous 1960s recordings. Which I already have and treasure and which are available in Novemnber 2012 in two different boxes for a good price. I advise to buy those as long as they are available!